Gold rains on a heart of gold. Ingo Hasselbach as the hired serial killer. Richard Curtis wrote the original. A RomCom fighting hunger. What we go through to become who we are. Maria von Heland is a Swedish-born writer and director working out of Berlin, Germany. and a BA in TV journalism from Rider College, NJ. She studied acting in Paris and New York, and photography in Stockholm, Sweden. Maria speaks Swedish, English, German and French. – Just got off shooting a comedy for German Television ARD/Degeto – script Katja Kittendorf, Maria von Heland. Starring Silke Bodenbender, Tom Wlaschia, Nina Petri, Steven Scharf. Currently editing with Knut Hake in Berlin. – Maria is adapting Five Regrets of the Dying – the international bestseller by Bronnie Ware – for the big screen. Producer: Nicole Swidler, Enigma Film. – Tanja Stewners bestselling youth novel “Alea Aquarius” is being adapted by Antonia Rothe-Liermann and Maria, to be directed by Maria. Producer Dorothe Beinemeier, Red Balloon. – The magic realist comedy DAS LEBEN IST KEIN PONYHOF starring Tuva Novotny (AKA Real Men Don’t Dance) is in the financing phase. Written and to be directed by Maria. Produced by Sigi Kamml/Christian Alvart of Syrreal Film. – The the 29th gala of the European Film Awards will take place in Wrocław, Poland on the 10th December 2016. Maria is writing/directing the show for the stage. – HEIRS OF THE NIGHT, TV series (Hamster Film,Phillip Kreuzer, Maipo) – 26 episodes (2 Seasons) in the planning, created by Maria von Heland based on the novel series by Ulrike Schweikert. Commissioning editor from NDR: Sandra Le Blanc. Development financed by Hamburg Film Fund/NDR Ole Kampowski/ZDF Enterprises. – Maria continues to develop and write screenplays as well as international TV series – current projects in development with Good Friends Filmprod., Dreamtool Entertainment/EPO Film and Red Balloon. – Emmy nominated THE DEVIL WITH THE TREE GOLDEN HAIRS directed by Maria von Heland. Cast: Jakub Gierszał, Saskia Rosendahl, Thomas Sarbacher, André M. Hennicke, Bernd Stegemann. – GÖTTLICHE FUNKEN, co-written and directed by Maria von Heland. Incredible reviews and great ratings after the TV premiere on Friday May 30th. Produced by Nataly Kudiabor NDF. Cast: Jeanette Hain, Devid Striesow, Anna Maria Mühe and Barry Atsma. Camera: Moritz Anton. Editor: Uta Schmidt. A 90 mins Drama for ARD/BR/Degeto. Broadcast 32 times on German TV time since May 2014 – over 5 million viewers. – The comedy Hector and the Search for Happiness starring Starring Simon Pegg, Rosamund Pike, Toni Collette, Stellan Skarsgård, Jean Reno, Christopher Plummer and Barry Atsma written by Maria von Heland and Peter Chelsom & Tinker Lindsay and directed by Chelsom was released internationally in 2014. 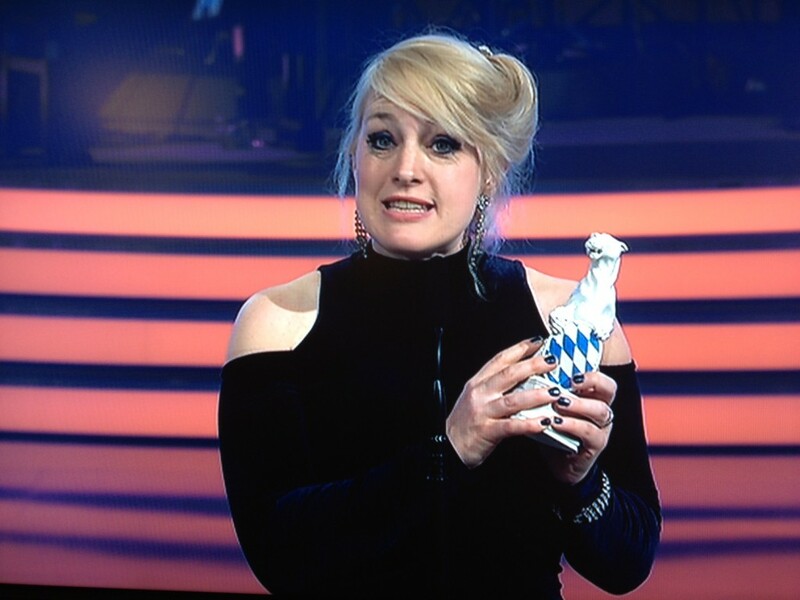 Maria with the Blue Panther May 2012, the prestigious Bavarian Award: Best Directing for Star Talers!